Build big muscles with these healthy, high-protein snack bars! 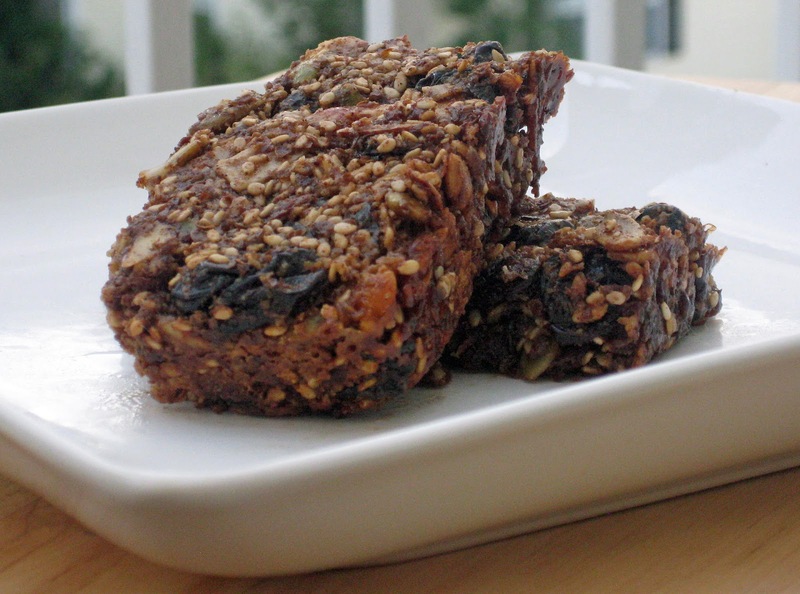 These all-natural snack/energy bars are PACKED with protein! They've got almonds, pumpkin seeds, almond butter, sesame seeds, and flaxseed. Of course, flaxseed is also a great source of Omega-3's, which helps reduce (post-exercise) inflammation. Per 1/4 c. serving, pumpkin seeds, flaxseed, and almonds each have 8 g. of protein, while sesame seeds have 6.36 g. Almond butter has 7 g. of protein per 2 Tbsp. serving. These nuts and seeds contain heart-healthy, monounsaturated fats which, in combination with their protein (and carbohydrate) content, will really satisfy your hunger and fill you up. A little goes a long way, so easy does it. :) You'll be surprised how filling one serving, (i.e., a 3 1/2 x 2 1/8" x 1/2" bar), really is. Although these bars are intended to be eaten as a snack, they could also be eaten as a breakfast bar, for those of you who are rushing out the door and don't want to miss breakfast. They've got protein, carbs, and healthy fats, and so, would certainly be a healthy, satisfying way to start the day. Directions: Preheat oven to 350°F. Add all ingredients to a medium-sized bowl and fold together until thoroughly combined. Pour into a 11" x 7" metal brownie pan lined with parchment paper and spread mixture across pan until it's completely covered, pressing down a bit to compact the mixture a bit (to about a 1/2" thickness). Place into the oven and bake for about 35 minutes, or until golden brown. Allow to cool completely, about 10-15 minutes. Then cut into 12 (3 1/2" x 2 1/8") bars. (Do not remove them from the pan.) Chill in the refrigerator for at least 1-2 hours to allow bars to set. (This will help the bars further solidify.) Transfer the bars to a serving plate using a small spatula, storing the remainder in an airtight container for future snacking. (They should easily lift from the pan.) Serve and enjoy!